Razor Web is one of those adware applications that look like they could provide you with some useful information when you access online shopping sites, but in reality they just enter your PC to make money for its developers. Luckily, Razor Web does not steal your financial information or anything like that, but it is still necessary to remove this program from your PC because there is no telling what could happen if malevolent third parties made use of Razor Web and all of its functions. That is why computer security experts always say that it is important to delete adware applications, as they are too vulnerable to third-party exploitations. The core of this program does not seem too complicated. Based on our research, Razor Web is yet another clone of Assist Point, Positive Finds, Strong Signal, Dragon Branch, and many other adware applications that come from the same group. They usually have their own homepages (like myrazorweb.com), but the official sites do not contribute to the overall adware distribution. After all, there is not that much chance that users would accidentally stumble upon such a website and download the adware directly. Razor Web creators would not use their funds to promote this application on third-party websites. Therefore, the primary method of distribution is software packages. There are multiple software bundles that are uploaded on a number of file-sharing websites. Most of the time, users are not aware of that fact that they download more than one program from such sites. On top of that, it is usually possible to avoid installing Razor Web as long as you read all the installation wizard steps. However, usually users skip those steps because they want to install some application as soon as possible. As a result, such unwanted programs like Razor Web get installed on your PC as well. This adware program is based on the Injekt engine, and it is rather similar to the applications from the SuperWeb family. It means that we can expect a similar type of behavior from Razor Web as well. This application will add extensions to Mozilla Firefox, Google Chrome, and Internet Explorer. These extensions will track your online browsing habits to find out what you search for the most. Consequently, Razor Web will start displaying commercial ads, pop-ups and shopping offers. Most of the time, they are merely annoying, but at the same time these pop-ups are your biggest security concern. The problem is that Razor Web does not bother to check the third-party content that gets embedded in its ads. Thus, cyber criminals could embed corrupted outgoing links that lead to unreliable websites. Most of the time, such applications like Razor Web are exploited in fishy online marketing schemes, but in the worst cases, it might also be used in malware distribution networks, so you should avoid that at any cost. Please remove Razor Web from your computer right now. You can uninstall this program via Control Panel, and that is not a hard thing to do. At the same time, you need to remember that there might be other potential threats on your computer, and it would be for the best to scan your PC with the SpyHunter free scanner to determine which programs have to be deleted from the system at once. Do all you can to protect your PC from dangerous threats. Slide the mouse cursor to the bottom right of your screen. When the Charm bar appears, click Settings and go to Control Panel. Open Uninstall a program and remove Razor Web. Click the Start menu and go to Control Panel. Select Uninstall a program and remove Razor Web. Press the Start menu button and go to Control Panel. 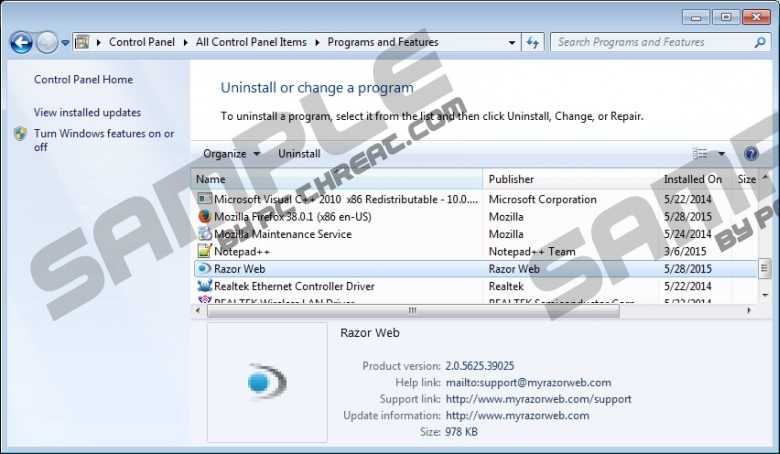 Select Add or remove programs and uninstall Razor Web. Quick & tested solution for Razor Web removal.